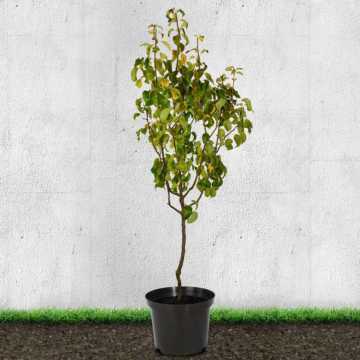 Hedges Direct has a variety of fruit trees available, all of which will make the perfect addition to any outdoor space. Their vibrant foliage and scented flowers offer a rewarding experience for anyone looking to grow a fruit tree in their garden. Our fruit trees are suitable for the UK climate and are ideal for all gardens. Depending on the size of your outdoor landscape, our selection of fruit plants can be planted and allowed to grow to their full height, or they can be kept in pots which will limit growth but remain healthy. The latter is ideal for smaller outdoor spaces. They also give you the option to move the fruit tree to a more desirable place, as well as moving into a garage or outhouse for protection from the winter frosts. Our fruit trees are easy to grow and maintain. The vibrant flowers and unique fragrances will add a new dimension to any outside space. Although our range of fruit trees are self-fertile, requiring no cross-pollination, they are a wildlife magnet for bees especially, which has the bonus of bringing a super pollinator into your garden to the benefit of other plants and flowers. Our collection of fruit trees includes the seasonal favourite Apple Tree - perfect for smaller garden spaces. We also have the Cherry Tree which is popular amongst gardeners and those who enjoy eating sweet cherries, Plum Trees, which grow the most delicious fruit and are perfect for making preservatives, and the Pear Tree, which harvests the most delicious pears. Whether you have a passion for baking or enjoy eating fruit, our trees will make the perfect addition to your garden and home life. Our range of rootstocks can accommodate the different garden types including semi-vigorous, dwarf or very dwarf fruit trees. Where space is an issue our dwarf trees (insert link) are ideal, whereas, if you have space our semi-vigorous species are a great statement to have in the garden.